This one goes wayyy back. In the late 1970's ( I don't care whether you were born then or not!) I went on my first mission trip to Honduras with a group from Westwood Baptist Church in Cleveland, TN. We were putting a roof on a new school building for MK's (missionary kids). Our housing was about a mile from the worksite and my buddy and me (Jack Roach, my accountant for about 30 years) decided that rather than drive with the others, we would run to work. So we put on our running shoes, such as they were back in the 70's, and began the morning jog. Well, it wasn't exactly like the picture looks, but the jog did quickly become a run. We "picked up the pace" as we noticed this curious "cow with horns" coming at us. We tried to stay cool for moment or two, casually looking back. 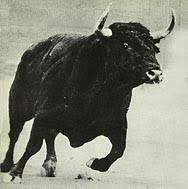 But the bull picked up the pace first. So Jack and I decided it was a good day to do our "speed workout". So I'm about 24 at that time. Of course I'm invincible and know just about everything at that age. And yet, even I was getting concerned as the bull was gaining on us. Fortunately, we arrived at the school site before the bull arrived at us. Our trip found none on our team very proficient at the Spanish language back then. We'd just kind of wing it by putting "El" in the front of whatever English word we said, and an "O" at the end. For example, the hammer was "El Hammero". We had a lot of fun on that first of many international missions experiences for me. Made some good friends. I even got to play the piano in a church during a service. Yet one of the most memorable memories was Jack and running with "El Merrill-Lyncho!"